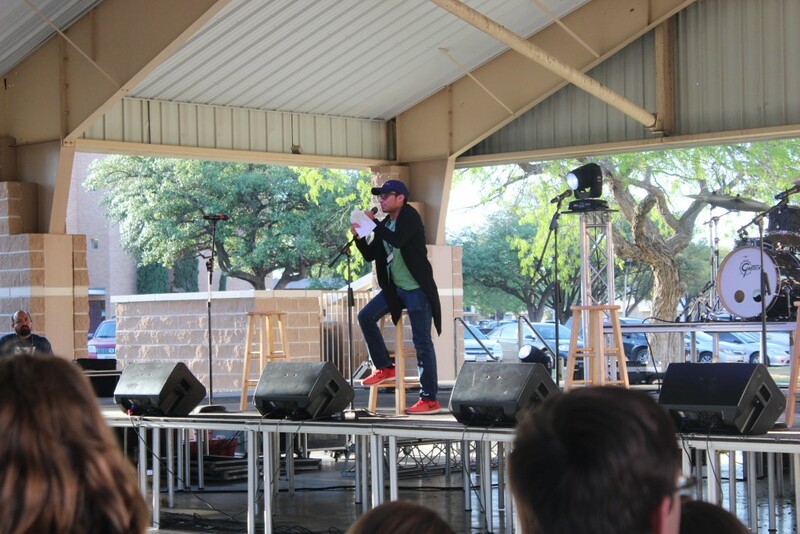 Justice Medina, UCPC Concert Chairperson, warms up the crowd for the band, Anthem Lights, at Springfest. Throughout the fall of 2016 and the spring of 2017, the people working on the University Center Program Council, or UCPC, have set a great number of activities for students of ASU to participate in. Students working in UCPC were asked what the 2016-2017 academic year was like for them, including what their favorite project was during this time and what it is like being part of UCPC. "My favorite thing that we’ve done this year is the Drag Rave," Brooke Elliott, freshman and Nighttime Chair for the UCPC, said. One of the UCPC’s successes this year, the Drag Rave, was something that a lot of people claimed as their favorite event. "My favorite event this year was when the comedian Adam Grabowski came," Precious Emeagi, junior and UCPC Club Café Chairperson, said. "I love the fact that he made the audience laugh and he was so sweet and took pictures with everybody." Grabowski was one of many comedians UCPC brought in. Jessi Campbell, Steve Hofsetter, and more were all free of charge for students to see. Yet, there were moments where UCPC members were challenged in new ways. Because of this, some members were asked what some of the most difficult parts of being in this group were. "The hardest thing was to come up with different ideas to gain a bigger audience for our events," Justice Medina, junior and UCPC Concert Chair, said. "There is only so much you can do to promote and get people to join UCPC or make it to our programs." Most of the replies involved how hard it is to gain publicity for upcoming events. However, some people talked about personal changes they had to make. "The hardest thing for me was getting out of my comfort zone," Jennifer Sauceda, sophomore UCPC Vice President, said. "I had to talk in front of people and meet new people. I learned to do so proficiently and professionally and it was totally worth it." Finally, as a group that any student would have the opportunity to join, these members were asked what they would say to anyone who may be interested. "You get to meet amazing people and you get to meet amazing artists," Sauceda said. "UCPC is just one big family. If you’re searching to find new friends or something fun to do, UCPC is the perfect place for you. We’d love to have you." People can contact UCPC or go to its events to learn more about the group and sign up.